I am going to start with a disclaimer. Hero Drifter floats are the only custom made floats I have used. I am not comparing them to other custom floats or even plastic floats such as Clear Drift. I am comparing them to mass produced balsa wood floats. Hero Drifter floats are hands down the best floats I have ever run. I have now been running them for a couple weeks and they are awesome. Michael Weber makes some sick looking and sweet running floats. The quality is seen immediately when you take them out of the heavy duty shipping container he mails them in. I ordered a dozen Ninja’s and a half dozen of his Rock star floats with my logo on them. I am going to very loosely say these compare to the Raven balsa wood floats. I say loosely because they only compare in size and shape. The quality of the Hero Drifter floats is so much greater that there is no real comparison past that. The first time I fished them I couldn’t believe how much better they ran. I had always wondered is it worth spending a little more than double what a mass produced float costs? The answer yes absolutely. Once you fish them you will understand. They run the edges of seems and stick there. They make it some much easier to get the bait where you want it. If you run a quality pin reel and keep the line of the water you will be amazed at how well they hold the line you want them too. There is nothing worse then having your float move from the line your a trying for right before it gets where it needs to be. You will not have that problem with Hero Drifter floats. My clients have been loving them and it has actually made my job easier. When the float runs true and stays where it should it is so much easier for people that are just learning to float fish. Last Saturday I met a couple friends after my trip and let them borrow a Ninja for the afternoon. Both of them sent me a message later that afternoon and had nothing but good things to say. They were shocked how much better they were than the mass produced floats they had been using. They also both plan on ordering floats in the near future. If you are ready to step up your float fishing game ditch the Raven’s and order Hero Drifters. You won’t be disappointed. If for some strange reason you are just give me a call and ill buy them from you. This post is not to try to keep people away or scare anyone. I just want to make people aware so maybe we can catch the people doing these things. Over the past few months there have been numerous crimes committed in the fishing access parking lots. Nothing violent has occurred yet. There have been cars broken into and fishing gear stolen. People have returned to vehicles to find the windshield wipers missing. There have been a few different people’s tires slashed. Then there was an incident Friday night that I became involved with Saturday morning. At approximately 5:30 pm Friday night my friends had left their drift boat anchored at the Pineville ramp to go get the trailer. Someone pulled up the anchor rope and pushed the boat down the river. When the boat was found the oars were missing and the rods were all tangled with knobs in the boat and the cup holder. We believe people were attempting to steal the gear when it became tangled and send the boat down river so they could get away while the guys were trying to find their boat. The anchor rope was also pulled up so the anchor barely touched the water so we know it didn’t just come lose. There was a silver/gray beat up Hyundai or simular car leaving the parking lot when they pulled in that night. I am not telling you not to come fish the Salmon River. I am asking that when you do you are careful and alert. Please don’t leave valuables where they can be seen in your vehicle. Stay alert to your surroundings and if you see something that doesn’t seem right call the police. The State Troopers and the DEC are aware of the problems and patrolling the lots. The Oswego County River Guides Association is looking into what the guides can do to help catch these scumbags. This is not an easy solution as these lots are out of the way but see a lot of traffic. Please help out and pay attention. DO NOT IGNORE SOMETHING IF YOU SEE SOMETHING THAT DOESN’T LOOK RIGHT!!!!!! Also call the police instead of confronting the person or persons. These scumbags are most likely drug addicts desperate for a fix. Everyone carries a camera or a phone with a camera fishing so get a picture of the license plate and call the authorities. Now on a good note we did recover the boat and it was only missing the oars. We also managed to hook and lose 4 steelhead during our quick trip down the river. The fishing is still not lights out but it’s definitely getting better. Tight lines….I hope my next post is better news. 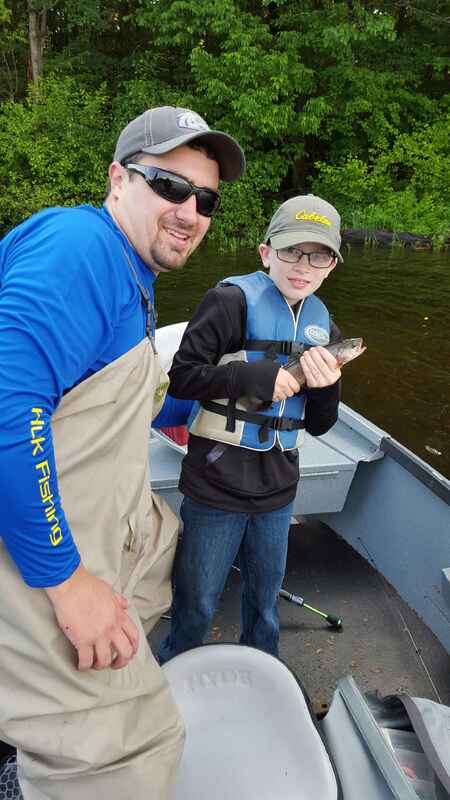 I am please to say that the Redfield kids fishing derby was again a huge success with 51 kids entered. Congratulations to Marry Smith who won the fishing trip with me or $300 cash. I haven’t heard yet which she chose as she wasn’t present the day of the drawing. I had the pleasure of taking Adam and Matt Trudell with their dad Mark for the Morning. We had some minor set backs in the morning causing us to get on the water about a half hour later than planned. It turned out to be ok though as Adam took first place in his age bracket for biggest fish and Matt took second in his. 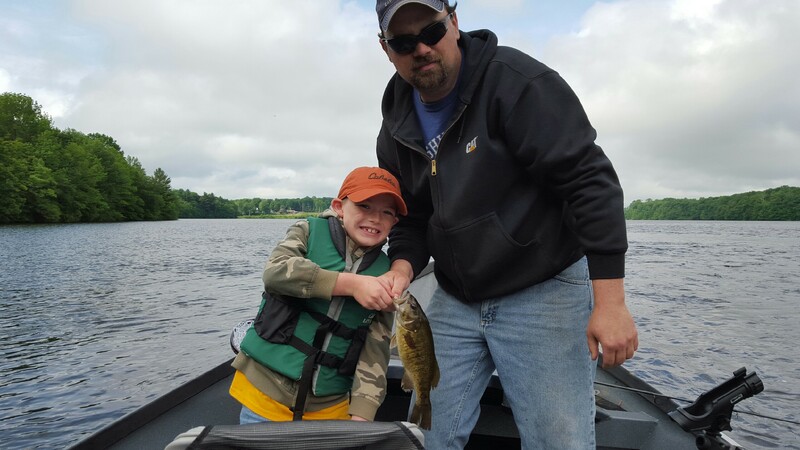 We caught a mixed bag of rainbow trout and smallmouth bass. 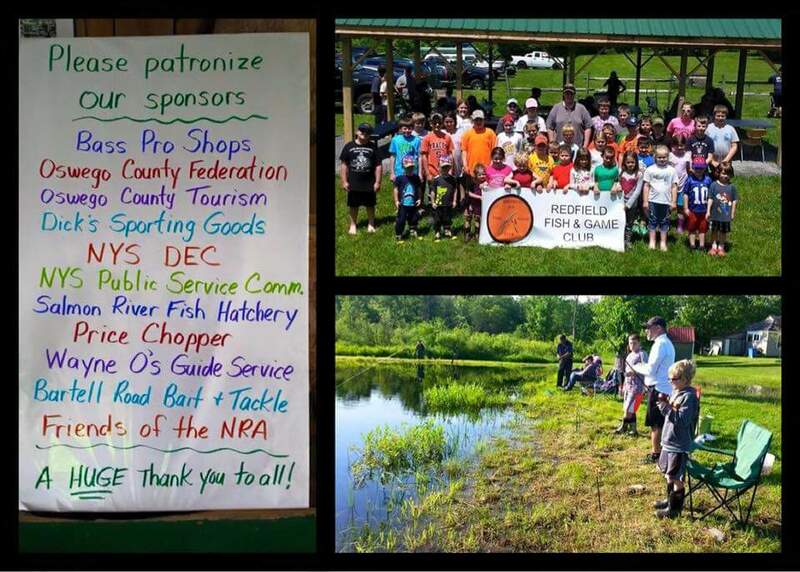 A big thanks to all the other sponsors especially Bass Pro in Auburn, NY as they made sure every kid that entered left with a new fishing rod. This is a free fishing derby put on every year and is a great event for the kids as no one leaves with out a few things and a full stomach. This is a great point. Life is not a dress rehearsal. If you want to do something do it now.